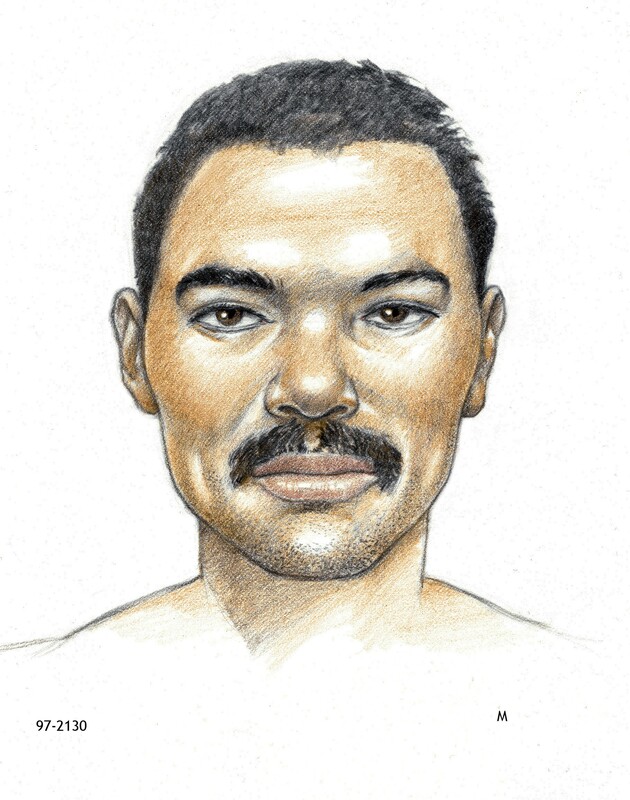 This unidentified Hispanic male was found deceased in the area of South Central Avenue and Buckeye Road in Phoenix, Arizona on 8/4/97. He was 30-40 years old, 5'05, 130 pounds, brown eyes, and black hair. He had a moustache. He had a number of distinctive tattoos, including: Right chest: letter "B" in ornate lettering; left chest: letter "B" in ornate lettering with the name "Lupita" beneath it; a rose on his upper right arm; a man's face with the number "13" on his upper left arm; a jaguar on his inner left forearm; the word "Tijuana" in large letter across his abdomen. The subject also had a scar on his right knee. Found near the body was paperwork with the name "Juan Martinez" (4/13/70) but this could not be verified as his name. The subject was wearing a white t-shirt with the words "Pulmcroft Family Fellowship Camp" on it, khaki pants, and black sneakers. 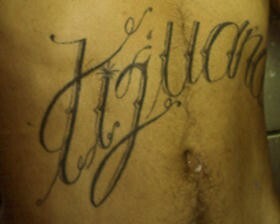 He had a number of distinctive tattoos, including: Right chest: letter "B" in ornate lettering; left chest: letter "B" in ornate lettering with the name "Lupita" beneath it; a rose on his upper right arm; a man's face with the number "13" on his upper left arm; a jaguar on his inner left forearm; the word "Tijuana" in large letter across his abdomen. The subject also had a scar on his right knee. 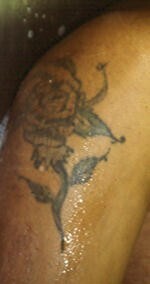 Picture of rose tattoo on upper right arm.